This is a guest post series from Danielle of Roadschooling with The Frugal Navy Wife. It was originally published on February 26, 2016. Daniele and her family homeschool while on the road in their RV – also known as roadschooling! Come follow along with Daniele as she shares her wisdom in this Roadschooling series here on FHD! Danielle will teach us tips for buying an RV, organizing an RV, her thoughts on RV insurance and memberships, and tons more. When you start RVing, one of the biggest expenses is your campground. You can spend between $600 – $900 a month! Depending on where you are and the time of year, it can be as high as $1500 a month! OUCH! So what can you do? Here are 5 great ways to save on your campground. 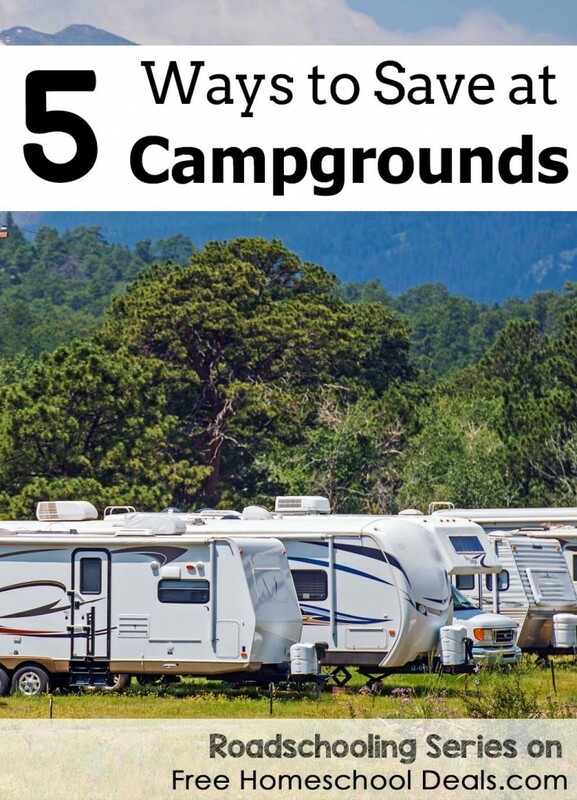 There are a variety of camp ground memberships available to RVers. Some will save you a small bit, and some will save you a TON! → One type of membership offers discounts. Memberships such as Passport America, Good Sam, and KOA offer a 10%- 50% discount off the daily rate. These memberships often will not work on any special packaged rates. → Thousand Trails Elite is another type of membership which requires a large sum up front – around $3,000 – $6,000. Then you pay yearly dues around $300 – $600, which allows you to stay for free in any of their parks. You can stay for up to 21 days then you have to move to another park in the system. This can save you a great deal of money! In some cases, you can save over $9,000 a year if you are full-timing and if you stay with them exclusively. This may not be a good option for families who need to stay in one area, since the membership might not have parks in every state. → Ready Set Camp is another membership option. They have a few levels of membership to choose from but the highest you pay is $300 a year and can stay at any of their parks for $20 for up to 90 days in a calendar year. This is ideal if you plan to be in an area where season prices are higher, such as Florida, where it can cost you up to $1,500 a month for a spot! This is how to camp for free! Fill up your water tanks and go off grid for a few days a month to save some money. If you can do this for 5 days a month you can save upwards of $200 a month. This doesn’t mean you have to go off grid for 5 days in a row. You can do 2 days here and a day there, if you so choose. Many camp ground sites offer weekly rates, so if you plan to stay at a site for 5 days, it might be worth it to stay the extra 2 days and get the weekly rate. Also if you stay for more than 7 days, make sure to ask if the camp ground offers a weekly rate. In most cases the weekly rate is equal to almost 2 nights free or more. Piggy backing on the concept of the weekly rate above, most parks also offer monthly rates. In most cases, this is the price of 2 weekly rates plus a bit more, so it’s like getting a week and a half free. You can also get even better rates by staying more than 1 month. While it’s not the first thought for saving on your camp ground spot, this is one of the best in my opinion. You work about 20 hours at a camp ground per week, and in exchange, you get your camp spot and hookups for free. These jobs are normally in the summer and you usually have to commit to 2 or 4 months at the time. However, if you are in an area that you love, it makes it fun! In many cases, after you work your 20 hours you can earn an hourly wage for any additional work. What ways have you saved on your campsites? → 5 Ways to Save at Campgrounds – this post!